It’s been a while since I posted. The MA has been on the back boiler over Christmas and the New Year holidays. I realised that if I want to keep some continuity with the course I must try to stick to a routine of posting once a week when possible. I am not sure that the content of the blogs will be of much value other than to provide a continuing structure. Returning to switch focus back to this work. I am beginning to sift through video clips of the field. One of these clips ‘Small Field’ was shown in the Camberwell show end of last year. ‘Poles’ is a stop animation where I was beginning to looking at different speed and transitions of a stationary, fixed object in a landscape, where the recorded movement was generated from the of moving the ‘eye’ or camera. It made me realise that movement is something I have been looking at in a purely visual context. Following it or tracking it with a camera. But there is also a physical aspect of movement between points. Moving from A to B. Which paradoxically supports or allows a belief in a form of permanence in our transitory everyday lives. We ignore the constant transience movements carry us through our days. We expect to keep breathing and not to have to think about it. Not to be reminded that we are alive because of involuntary and voluntary movements that we take for granted and push into the background. The notes below are very sketchy. It has been a hectic week with Samuel very unwell and therefore missing a booking at Dance City to use studio and projector also my dropping one of the cameras last Friday so it broke and then finding myself locked in alone at the local community center due to the caretaker forgetting I was on site. 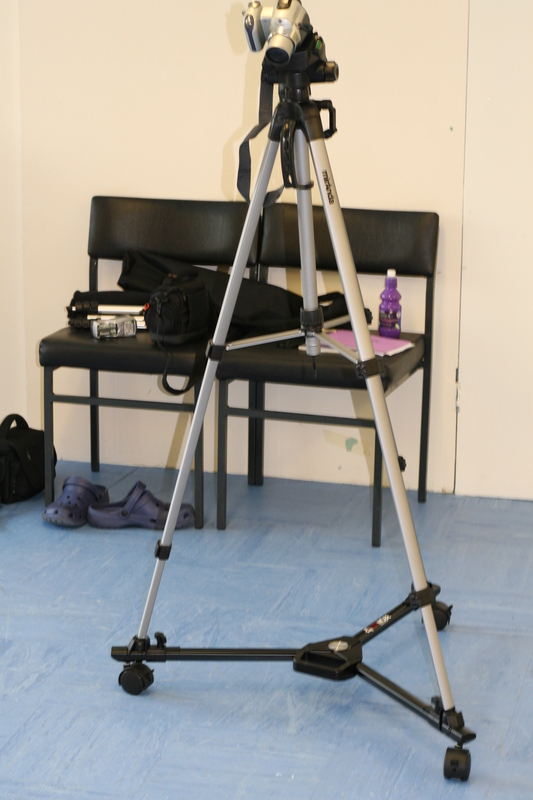 Have invested in a new piece of equipment called a tripod dolly . This basically is a set of wheels to fit the base of the tripod which allows me to move the camera smoothly and avoid the shaking horizon line that makes the viewer feel motion sickness. I chose this over the fig rig researched last term as I wanted to be sometimes hands free of a moving camera eg: by pulling or sliding the dolly so that it moves by its own momentum. I have been trying to scratch at understanding the idea of the ephemeral and movement. That life relies on something constant yet transient seems a puzzling contradiction. For other uses, see Ephemeral (disambiguation). Ephemeral things (from Greek εφήμερος – ephemeros, literally “lasting only one day”) are transitory, existing only briefly. Typically the term is used to describe objects found in nature, although it can describe a wide range of things. In this research I came across the term ‘ephemeral film’ and open source. Which lead on to ‘orphan works’ which we discussed with Jem during the previous week’s chat. Working on Jem’s Swarm TV project has really brought home to me the shift in the ideas around intellectual copyright that are occurring due to the web. It helped me to question more the idea of working with others material in a way that was unfamiliar to me. I think it is a project that I will find increasingly informative in hind sight. I am sorry that it is completed. I am finding I really enjoy collaborative projects. It also brought home that there is a lot more research that I need to undertake. these are some links from wiki around the idea of movement. In physics, motion means a continuous change in the location of a body. Change in motion is the result of applied force. Motion is typically described in terms of velocity, acceleration, displacement, and time. An object’s momentum is directly related to the object’s mass and velocity, and is conserved within a system, as described by the law of conservation of momentum. Everything in the universe is moving. As there is no absolute reference system, absolute motion cannot be determined and only motion relative to a point of reference can be determined; this is emphasised by the term relative motion. Humans, like all things in the universe are in constant motion, however, aside from obvious movements of the various external body parts and locomotion, humans are in motion in a variety of ways which are more difficult to perceive. Many of these “imperceptible motions” are only perceivable with the help of special tools and careful observation. The larger scales of “imperceptible motions” are difficult for humans to perceive for two reasons: 1) Newton’s laws of motion (particularly Inertia) which prevent humans from feeling motions of a mass to which they are connected, and 2) the lack of an obvious frame of reference which would allow individuals to easily see that they are moving. The smaller scales of these motions are too small for humans to sense. Muybridge attends the Columbian Exposition at Chicago and provides a work entitled ‘Descriptive Zoopraxography’. The Zoopraxiscope is the star of the show as Muybridge presents his work at his Zoopraxigraphicall Hall. Muybridge’s Zoopraxiscope Plate Disks were hand painted by Thomas Eakins and also Erwin Faber. These two animations show the illusion created by the ‘Waltzing Couple’ — full disk (above left), and the view through the Zoopraxiscope (above right). I was looking at Kurt Schwitter’s use of ephemera and that lead to the works of Billy Childish. Who is currently involved in producing Bagzine.